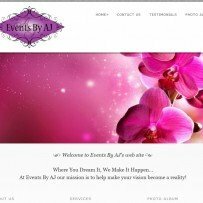 Events By AJ - Collective IT Solutions, Inc.
Events By AJ is no longer in business. This was a great photographic website with a nice gallery displaying many events the company had completed. There were also forms available to submit for information and events. A custom logo was designed for this company as well.